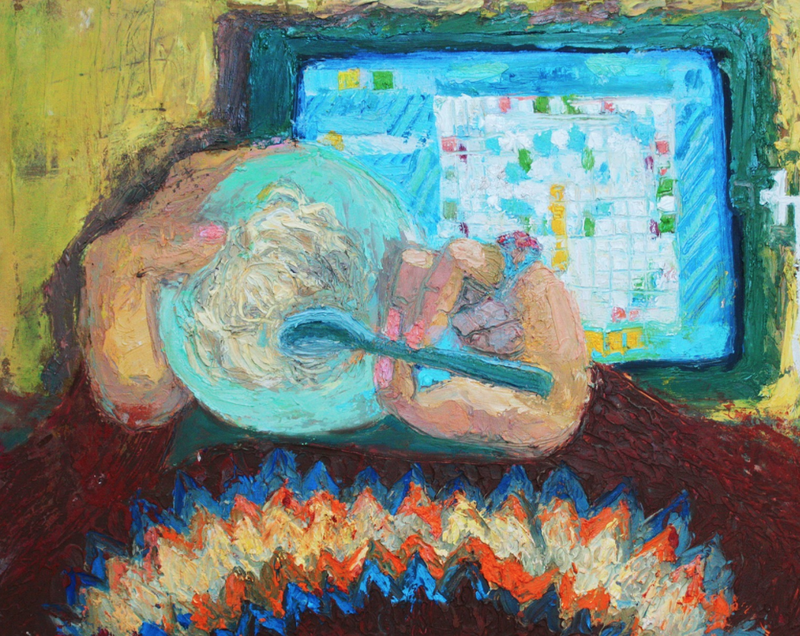 Ashley Norwood Cooper is an artist I’ve known as a maker of painterly, domestic narratives. 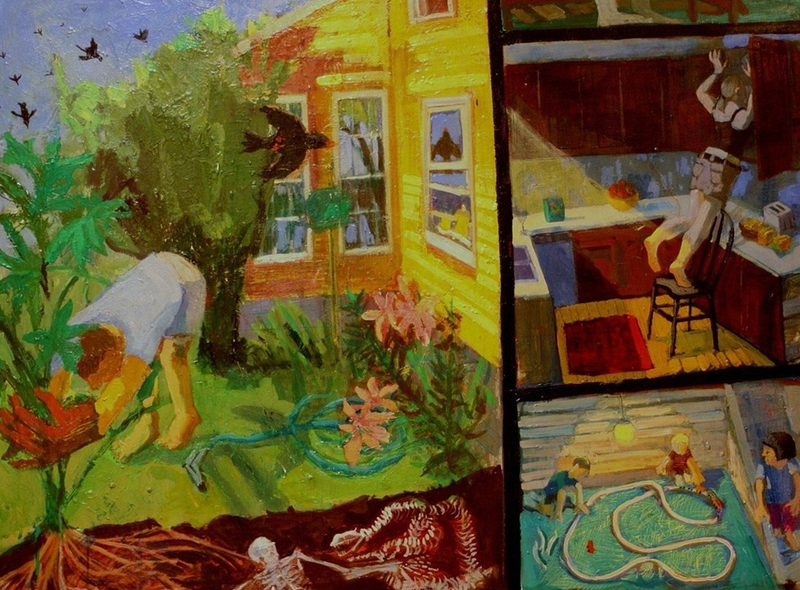 Typically her painting mash up mundane and unsettling imagery using cutaways, shifting perspectives and an enviable bagful of painter’s tricks. The other day, I saw an announcement for a new body of work, based on her experiences during the time her husband Shelby was deployed to Afghanistan as a U.S. Navy surgeon. 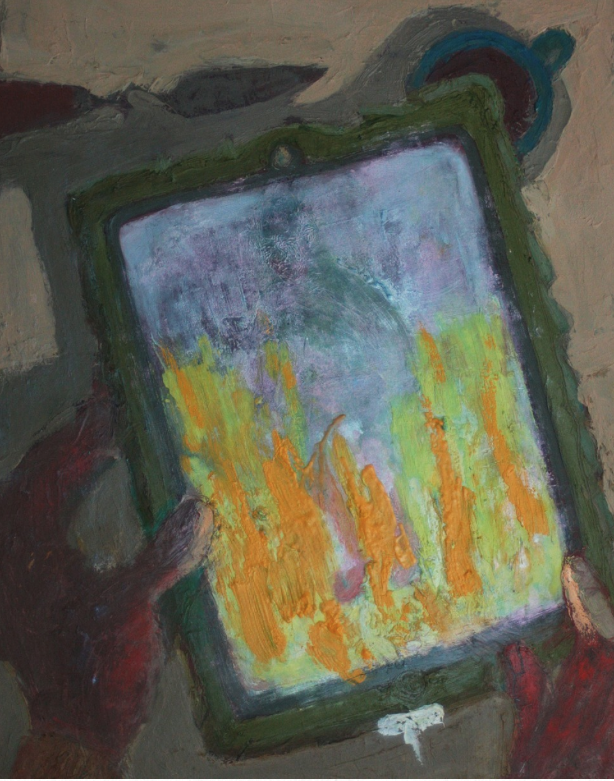 Most of the paintings show Cooper’s own hands, holding an iPad and a few choice glimpses of objects and spaces beyond. The paintings, in her words, ” are about this correspondence which consumed me for nine months. The contrast between the thick tactility of the oil paintings and slick, temporal nature of digital media, points out how different these two forms of expression actually are. Digital images, with their speed of light convenience, are no replacement for the expressiveness of paint. 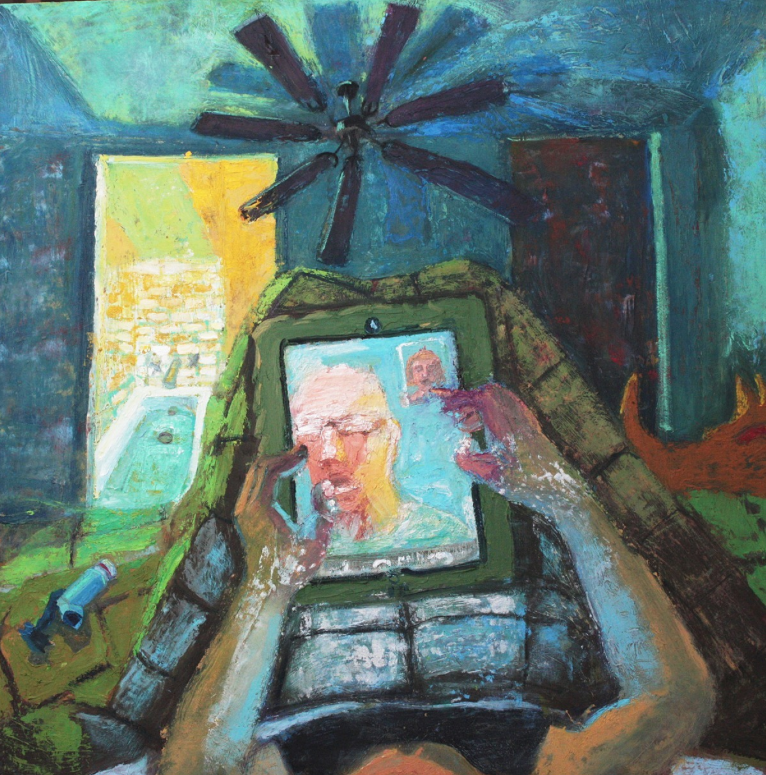 Likewise, my ‘virtual husband’ was no replacement for the real thing.” The resulting paintings are an amazing combination of thoughtful, heartfelt and original, with a little of-the-moment cultural relevance thrown in to boot (though I think “thoughtful, heartfelt and original” is the true strength of the series). 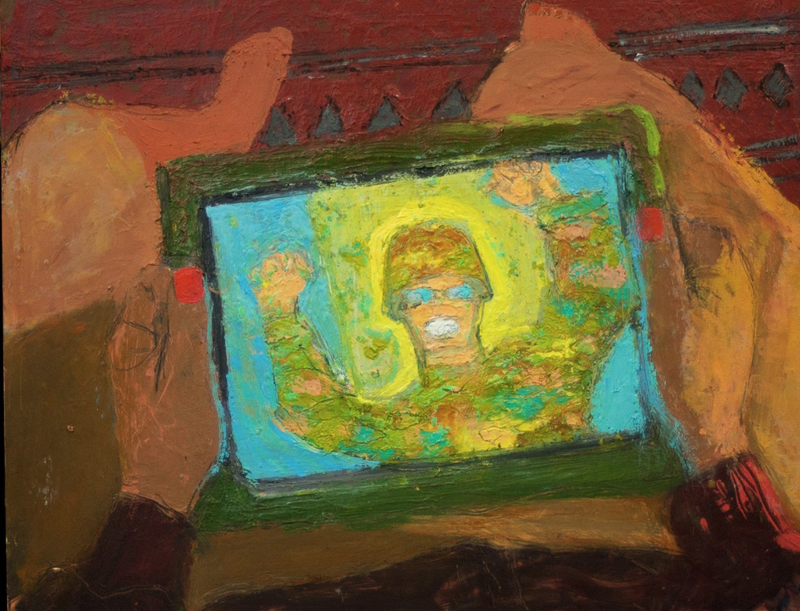 I asked Ashley about her work, her family and the resonance between the idea that painter is to her painting as spouse of deployed surgeon is to her iPad. See the full series of “Deployment” paintings at her website. I grew up in Greenville, SC and attended the University of Georgia. Though I was very involved with art in high school and college, I graduate with a major in Latin. I was a Latin teacher for a little while before attending graduate school at Indiana University, where I got an M.F.A. in painting. Now I live in a very small town in central New York with my husband, three kids, and too many pets. I paint in a studio behind my house. My paintings are almost always fairly autobiographical. I have always been interested in drawing, painting and story-telling, these elemental ways that human beings create meaning. I believe that these activities are basic to humanity and that they cannot become outmoded or be replaced by technology. Painting is a discipline I submit to each day as my way of understanding my life. 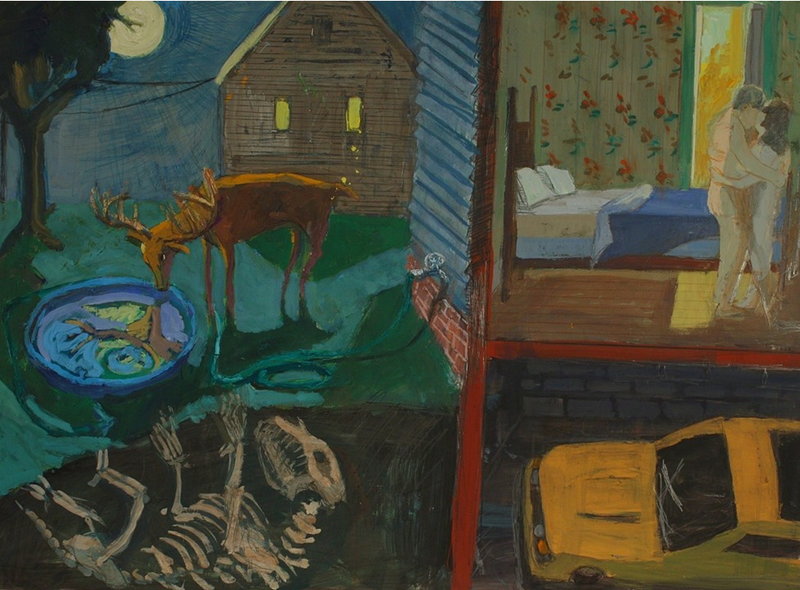 The way that painting connects what we see to what we imagine to the materiality of mixing colors and laying down paint is unique. It is changes the way you see things and understand your world. I don’t paint as much because I have something to express as because I have something I want to explore. As a painter, you spend huge amounts of time alone in your studio, in a sort of imaginary world, but you don’t feel like you are alone at all. When I am in my studio I feel like all my favorite painters, dead and alive, are there and we are engaged in this very serious conversation. We are laughing and joking and cheering each other on. I listen to music and sing and talk to myself out loud. As long as I have my paint brush in my hand, the world of the studio seems much more real to me than the world outside. In the Odyssey, Penelope, Odysseus’ wife, waits for twenty years for her husband to return from the Trojan War. She has no idea where he is and everyone else is certain that he has died at sea. Her home has been taken over by suitors who want her to marry one of them. They are eating all of their food stores and drinking all of the wine in their wine-cellar. These suitors have declared that they won’t leave until she chooses a husband. But Penelope is busy weaving. She is weaving a funeral shroud for her father in law and she says she won’t remarry until it is done. Each night she sneaks into her studio to unravel what she has woven that day, thus buying herself more time. In a way, all artists are like Penelope. We have to be incredibly patient. The Muse doesn’t come the moment she is bidden. We have to “waste” amazing amounts of time in the studio. We spend entire life times with little or no outside acknowledgement. Cezanne made bad paintings for decades. Even his best friend thought he was a failure. Like Penelope we weave and unweave while the real world calls us to make decisions, do something practical. So, it’s not something I’ve ever seen discussed before, but painting is actually a lot like a long distance relationship: there’s this mute and dumb inanimate object–the canvas or the tablet–that one spends an inordinate amount of time in physical contact with, physical contact that’s loaded with feelings, fantasies, hope, humor, regret, etc. Your statement about the “Deployment” paintings alludes to this and I’m wondering if you could expand on this aspect of these paintings? As I worked on this series I became more and more interested in the similarities and contrasts between paint on canvas and electronic media. As one who has painted for years, I am used having this obsessive relationship with paint and brushes. I know how paint feels and how I expect the tools to respond to my hand. I never had been able to form this same relationship with my electronic devices. I tended to loose my cell phone or forget to charge it. It wasn’t until my husband went overseas that I began carrying a phone or iPad with me everywhere. My time talking to Shelby began to replace painting time. I was frustrated in the studio because I really wanted to make paintings about Shelby’s deployment but I couldn’t figure out how to express my experience of his absence. I would find myself sitting in front of my easel with my iPad in my hands texting. Then I started to realize that this electronic correspondence really was my experience of Shelby’s deployment. My life was on hold. I was staying up late at night talking to Shelby (Afghanistan is 12 hours ahead of Eastern Standard Time). I was exhausted and worried and barely able to drag myself out of bed to get the kids ready for school. 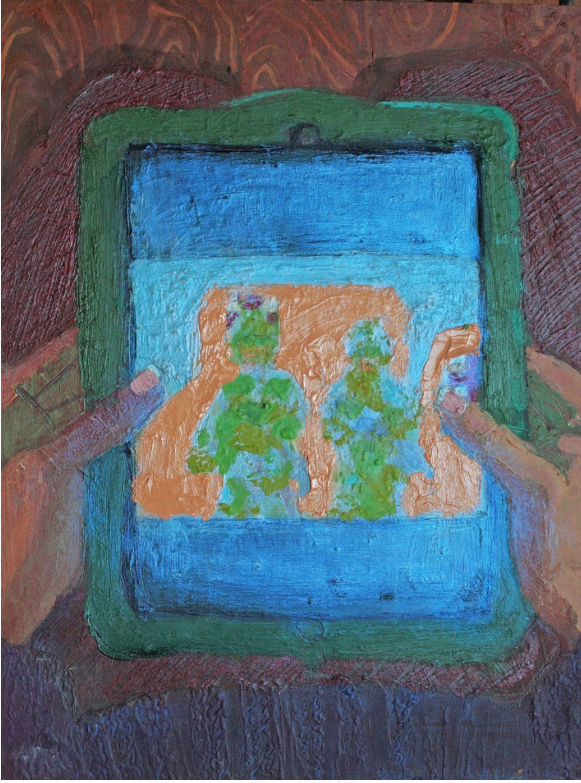 So I began to paint the iPad in my hands, this one obsessive view, as if nothing else mattered. 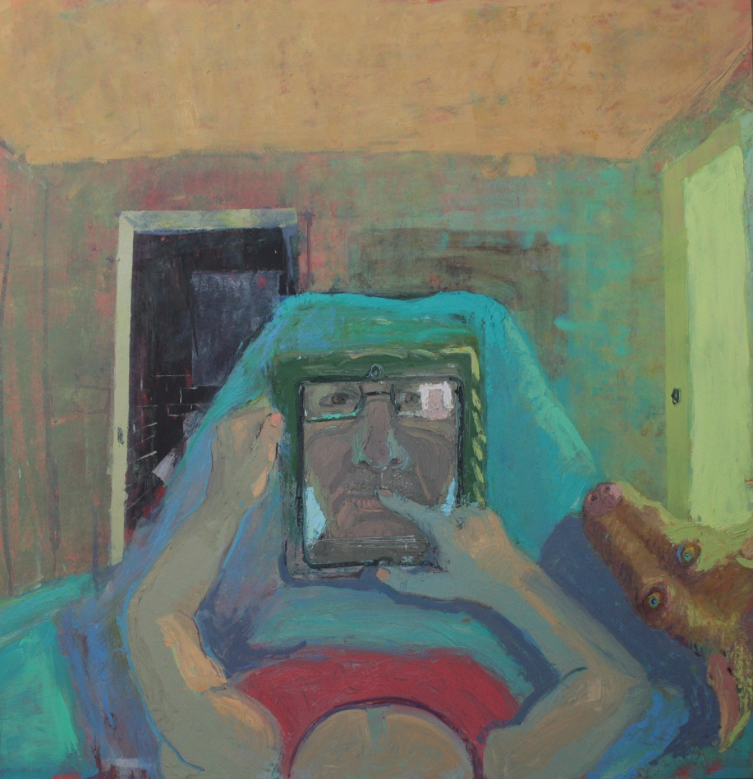 Then I began thinking about the screen and the painting surface and how they were alike and different. How the screen emits this cold light and how light in paintings is an illusion made with color and value. How the screen is slick and smooth and paint is messy and layered. I began to think that the iPad was to painting kind of like this long distance relationship was to having my husband with me in flesh and blood. I know this is addressed in your artist statement, but I feel like readers will want the information immediately on hand, where is your husband now? My husband was deployed as a surgeon in the U.S. Navy Reserve in 2012. He was stationed at a Forward Operating Base in Tarin Kawt, Afghanistan. He was gone for 9 months, two months training and 7 months in Afghanistan. During the time he was gone the children and I were, of course, worried sick, but we were able to talk to him over the internet on a daily basis. These paintings were inspired by his deployment and our communication with him. Now, he is back, safe and sound. Now that he is, what are you working on? While Shelby was gone I started the Deployment Paintings, but I continued to work on them when he got back. The most recent painting in the series deals with his return and our adjustment to having him back. As this series comes to an end, I am not sure what is coming next. I have enjoyed painting my hands engaged in different activities and that may be the leaping off point for my next series. Thank you, Ashley. That’s great! Read more MWC interviews with artists here. Great interview, full of interesting thoughts about living in obscure places and being faithful to one’s art, feeling one’s way to a new subject, and the mix of ancient practice with modern ways… Ashley’s work deserves to be more widely known.